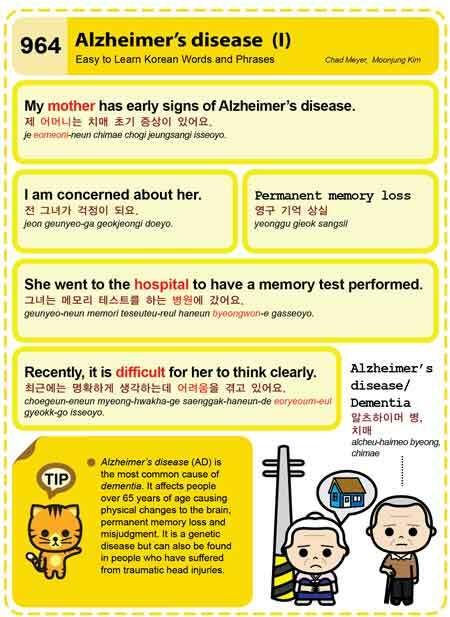 Easy to Learn Korean 964 – Alzheimer’s disease (part one). This entry was posted in Series and tagged 65 years old, Alzheimer’s disease, brain, dementia, difficult, hospital, I am concerned about her., misjudgement, My mother has early signs of Alzheimer’s disease., Permanent memory loss, test, think, 그녀는 메모리 테스트를 하는 병원에 갔어요., 알츠하이머 병, 영구 기억 상실, 전는 그녀가 걱정이 되요., 제 어머니는 치매 초기 증상이 있어요., 최근에는 명확하게 생각하는데 어려움을 겪고 있어요., 치매 by easykorean. Bookmark the permalink.